Our Louie is almost 15 years old. He is truly a geriatric dog. He still has a puppy face, and many people are shocked to learn his age. But look closer. He has arthritic joints, a sway back, rheumy eyes, a small growth on his left lower eyelid and a lipoma on his chest. He is also very deaf. His front legs have been badly bowed since he was very young. It was a birth defect that we didn’t notice when he was just 12 weeks old, when we got him. He looked perfect to us, and he was. Those crazy front legs served him very well all this time. Now when he walks, especially after lying down for a long time, he staggers, and sometimes one back arthritic leg, or the other just slips out from under him. But, he recovers quickly and keeps on walking. Sometimes his puppy persona takes over and he is downright frisky, jumping and running about. That burst of puppiness doesn’t last long these days. Seeing signs of aging in our beautiful pup is so hard. We all remember his crazy wild puppy play. He would run in circles or chase a ball forever. If nobody was paying attention he would nudge his ball into our pool and stand at the edge and bark until he engaged someone in his game. He would get so worked up he would ram into furniture, bounce off and keep going. He could jump 3 feet off the floor for the right treat. He had a high pitched bark or yip, and he used it often. He jumped up on furniture to watch out the window and guard our house. He was a ‘never fail’ alarm for incoming guests. And, oh, did he love to travel. We have taken him on countless camping trips. He is a real camping trooper, except that he is scared to death of campfires. And, he is petrified of fireworks and thunder, except for now, because he is deaf. A few months ago, I watched my patient son and husband separate and rescue entangled squirrels. I knew about Mike’s tenderness toward animanls. 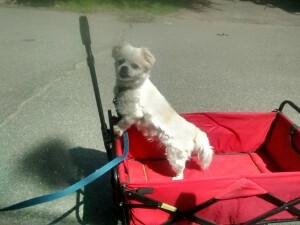 Every day I watch my husband go off with Louie, for a short walk, and now he pulls a red foldable wagon. Louie doesn’t/can’t walk all the way around our block anymore. He goes far enough to do his business, and Mike pulls him in his wagon the rest of the way. He loves it. Louie that is. Mike was a little self conscious when he first started using the wagon for his crippled buddy, but not anymore. I believe they have become well known in the neighborhood. It is such a heart warming sight to see my boys coming up the street, Mike pulling the wagon, and Louie riding in it. I asked Mike recently, “will you take such good care of me if I need it” My younger son immediately said “I doubt it”. Mike has the patience of a saint with Louie and it is something special to witness that. I worry about him when Louie has to go over the rainbow. There will come a day when he won’t be able to stand on his wobbly legs. Will that be the time? Or will Mike get Louie a doggie wheelchair? It could go either way, but if Louie is suffering, I know we will both agree on what is best for him. We voluntarily bring these sweet animals into our lives. Then we fall in love, just like when we have our human babies. They become part of us, our days and our home. They mark their space in every possible way. Louie knows he rules the roost. He communicates with Mike and Mike responds. Sometimes I think Mike understands dog speak better than human speak. 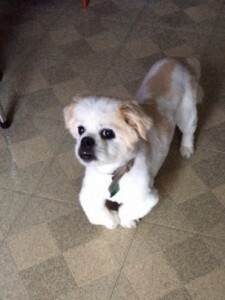 Louie’s yip, whine, sneeze, cough, or cry elicits almost immediate response from Mike, whereas, my yelp, whine, or complaint many times falls on deaf ears. I love all of my boys…Mike, Louie and my sons, but the special relationship between Louie and Mike is something to behold. There is a love and codependency like no other. I wish it would never end.